WASHINGTON (Reuters) – The United States slapped sanctions on 19 Russian individuals and five groups, including Moscow's intelligence services, for meddling in the 2016 U.S. election and malicious cyber attacks, the Treasury Department said on Thursday. 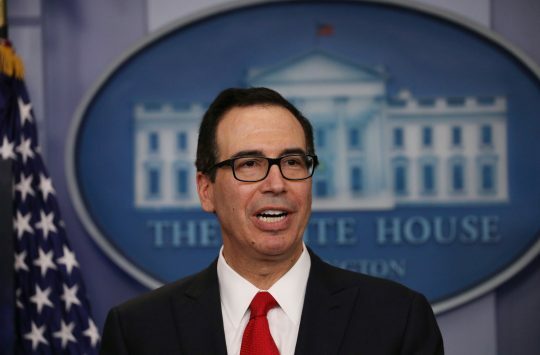 Treasury Secretary Steve Mnuchin said there would be additional sanctions against Russian government officials and oligarchs "for their destabilizing activities." Mnuchin did not give a time frame for those sanctions, which he said would sever the individuals' access to the U.S. financial system. U.S. intelligence agencies have concluded that Russia interfered in the 2016 presidential campaign using hacking and propaganda, an effort that eventually included attempting to tilt the race in President Donald Trump's favor. Russia denies interfering in the election. U.S. Special Counsel Robert Mueller on Feb. 16 brought charges against 13 Russian individuals and three Russian companies, accusing them of participating in a criminal and espionage conspiracy to tamper in the 2016 campaign. The indictment said Russians adopted false online personas to push divisive messages, traveled to the United States to collect intelligence and staged political rallies while posing as Americans. Those targeted by the new sanctions include the Russian nationals and entities charged by Mueller. The new sanctions also include Russian intelligence services, the Federal Security Service (FSB) and Main Intelligence Directorate (GRU), and six individuals working on behalf of the GRU. This entry was posted in National Security and tagged Russia, Sanctions, Steven Mnuchin, Treasury Department. Bookmark the permalink.